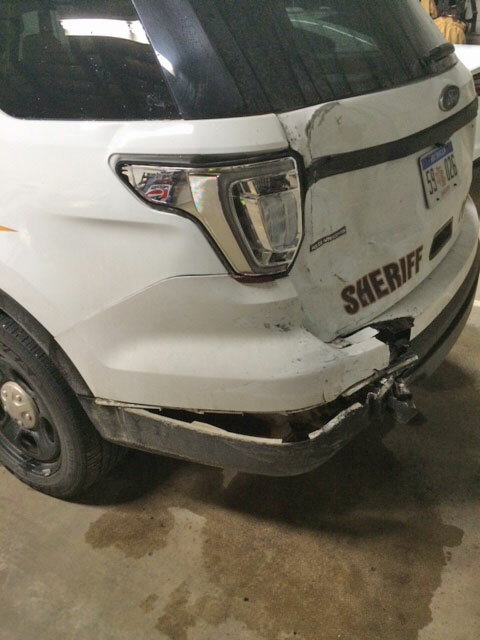 This Montcalm County Sheriff vehicle was struck by another vehicle while parked alongside US131. The Montcalm County Sheriff’s Office is advising motorists to slow down on slippery roads after a vehicle ran into one of their cruisers at the scene of an accident. While investigating a traffic crash on US131 near the Kendaville Road overpass on Saturday, November 21, a Montcalm County Sheriff’s cruiser was struck. The crash occurred at approximately 9:52 p.m. The deputy had his cruiser parked along the road edge with the emergency lights activated, while policing the initial crash. A northbound Ford F250 lost control and crashed into the cruiser. The cruiser was unoccupied at the time and there were no injuries.